Hello people of the internet!!! On today’s ‘YouTube Wednesday’ we’re going to talk about a band that a lot of you may already be familiar with. If you’ve ever heard of the indie pop rock band ‘King The Kid’, then you’re already familiar with the AMAZING new band that we’re going to talk about, ‘Future Sunsets’. After ‘King The Kid’ disbanded, two of the members, David Michael Frank and Jose Mostajo, decided to evolve their sound and Future Sunsets was born. In 9 short months, Future Sunsets has already proven to have a loyal fanbase, with 7,421 subscribers, and 288,047 total channel views. So please read on to see why you will have Future Sunsets’ music stuck in your head all year long! Ready? Ok, let’s go!!! The first video that we’re going to talk about is Future Sunsets cover of ‘Rather Be’ by Clean Bandit feat Jess Glynne, which was uploaded September 30th, 2014. I really liked their take on this song, because they kept the upbeat fun vibe that made this song so popular, but also added their own flair that makes this rendition unique. This song was a VERY strong start for Future Sunsets’ YouTube channel, and will definitely make you excited to see more from the band (you check out the video below to find out for yourself). The next video that we’re going to talk about is Future Sunsets’ cover of ‘Bailando’ by Enrique Iglesias, which was uploaded on December 31st, 2014. I thought that this was such a interesting choice for the band, and they were honestly able to pull it off very well. It’s fun to see a band you like take a chance with a song that’s a little different than what they typically do, but equally entertaining. You will definitely play this video over and over, and love it more everytime. 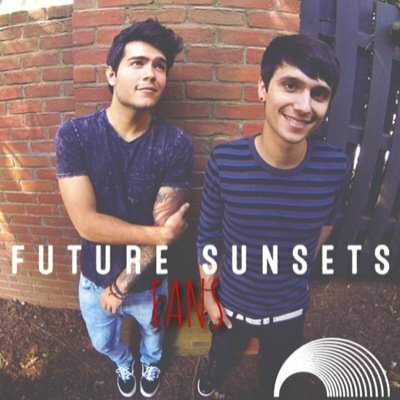 Next up we have Future Sunsets’ cover of ‘Iris’ by Goo Goo Dolls, which was uploaded on March 21st, 2015. This is a song that EVERYONE knows, whether you’re a fan of this genre of music or not. Because of this, there is definitely a added pressure to make an amazing cover, and the band perfectly hits this mark. They are able to not only make a rendition of this classic that is very well done and keeps your attention, but are also able to really make you feel the emotions that the lyrics convey. This cover definitely deserves 5 smiley face (because as I’ve said before, smiley faces are cooler than stars). The last video that we’re going to talk about isn’t a cover, but is a really awesome original song that you just gotta check out! Future Sunsets released the lyric video for their song ‘Without Your Love’ on December 16th, 2014 (you can check out the video below). This is a really cool song that has catchy lyrics, and upbeat vibe, and will instantly hook you as soon as you start to listen to it. It has a lot of the same elements that made fans fall in love with this band, but also show that they are constancy evolving and making their sound even better. I could definitely see them not only seamlessly integrating into mainstream music, but also stand out in such a way that will make them a cross-genre hit. All credit goes to YouTube, Twitter, Instagram, Tumblr, King The Kid, Future Sunsets, Warner Music Group, Jack Patterson, James Napier, Nicole Marshall, Grace Chatto, Clean Bandit, Jess Glynne, Enrique Iglesias, Republic Records, Descerner Bueno, Alexander Delgado, Randy Malcom Martinez, Carlos Paucar, Goo Goo Dolls, Warner Bros. Records, John Rzeznik, Rob Cavallo, all of the businesses, companies, people, and any other original owners involved and/or mentioned in any of these videos and/or hauls, any and all companies, individuals, and/or businesses that should receive credit for anything mentioned in this blog post, and all original owners. I do not own anything in this blog. If any people, corporations, businesses, companies, etc, were not previously given credit for their work, they are given credit now and their previous absence was unintentional. All opinions expressed in this blog are my own. I wrote this blog for entertainment purposes and no copyright infringement is intended. celindareyesblog July 16, 2015 No Comments on YouTube Wednesday: Future Sunsets…the band that will rule your summer playlists this year. Category: YouTube Wednesday. Tagged: Alexander Delgado, Carlos Paucar, Clean Bandit, cover, Descerner Bueno, Enrique Iglesias, Future Sunsets, Goo Goo Dolls, Grace Chatto, indie, instagram, Jack Patterson, James Napier, Jess Glynne, John Rzeznik, King The Kid, music, Nicole Marshall, pop, Randy Malcom Martinez, republic records, Rob Cavallo, rock, single, tumblr, twitter, Warner Bros. Records, warner music group, youtube, youtuber.